Concerns over a long-term decline in salmon stocks on Scotland's major rivers have been taken to Holyrood. Ettrick, Roxburgh and Berwickshire MSP Rachael Hamilton highlighted the situation on the likes of the River Tweed, Spey, Dee and Tay. She flagged up the number of jobs - about 2,800 - supported by angling and its £100m contribution to the economy. However, she said that over many years the success of Scottish fishing had "taken a knock". Ms Hamilton told the Scottish Parliament there was "no single cause" for the decline in salmon stocks but the impact was being felt "right across rural Scotland". "It is time for us to take action and tackle the issues head on," she said, before calling for a meeting of all the stakeholders to "forge a way forward". Ian Farr, a ghillie on the Bemersyde Estate in the Borders, said in a written submission to MSPs that he had witnessed a "serious decline" on the River Tweed over more than three decades working in the area. He said predators - particularly goosanders and cormorants - had "increased considerably" and needed to be "reduced and controlled" along with seal numbers. Mr Farr also said man-made impediments - weirs or dams associated with former mills - should be removed to help fish move more easily. "People come from all over the world, especially Belgium, Germany, Norway and Sweden, as well as the rest of the UK to fish on the Tweed," he said. "They come for the sport and the ambience of Scotland, which they see as the birthplace of salmon fishing. 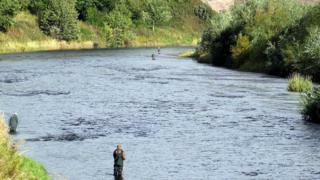 "The Tay, Spey, Dee and Tweed are believed to be the best salmon rivers and are the most famous in the world. We are starting to lose that prowess." Image caption Ms Hamilton said it was time to tackle the issues surrounding salmon stocks "head-on"
He said the decline was affecting local economies with people "holding off" booking fishing trips to see how numbers were holding up. "On Monday this week, there were around 500-600 people on Scotland's four major rivers, but they only caught 20 fish between them," he said. Mr Farr said that raised concerns about the viability of the industry. "I seriously fear that this could be the last generation of salmon fishing in Scotland and the last generation of full-time ghillies," he said. "The whole industry could just wither away," he added.